It is but an undisputed fact that healthcare data is perhaps one of the most voluminous and complex data that gets produced today. Lying beneath the humongous chunks of data are priceless understanding that have a direct impact on improving the quality of human lives. With the remarkable progress in Big Data analytics the data that was seemingly difficult to manage until as early as a decade ago, has come as a huge blessing in disguise for Healthcare Analytics per se. In the blog written below, let us together try and scrutinize the problems and challenges that could be surmounted with the in Healthcare domain with the application of Big Data Analytics, understand a few case studies and the tools that are used in this application. With the arrival of wearable devices, the collection of data has become even more easier and quicker. From the tracking of fitness data to geriatric care and intensive care, wearable devices have completely overhauled the entire process of data collection in Healthcare. The data thus collected can be stored using Hadoop and analyzed using Spark and MapReduce. One of the most popular applications of Big Data in Healthcare is the IBM Watson, an incredibly cerebral computing platform for healthcare analytics. It comes armed with natural language capabilities, hypothesis generation and an evidence based learning that assists medical professionals in their decision making process. Step 1 the physician puts across a question that is related to the symptoms of the patient and the allied factors. Step 2 Watson then pores over the given inputs by sourcing the available patient data like the family history, medications, the previous test reports, etc, apart from pondering over the doctor’s notes, clinical studies, research articles and other such relevant data. Step 3 Watson finally puts the list of the diagnoses with agreeable scores that signify the confidence levels of each of the hypothesis and in the process make both the doctor as well as the patients in making more informed decisions. 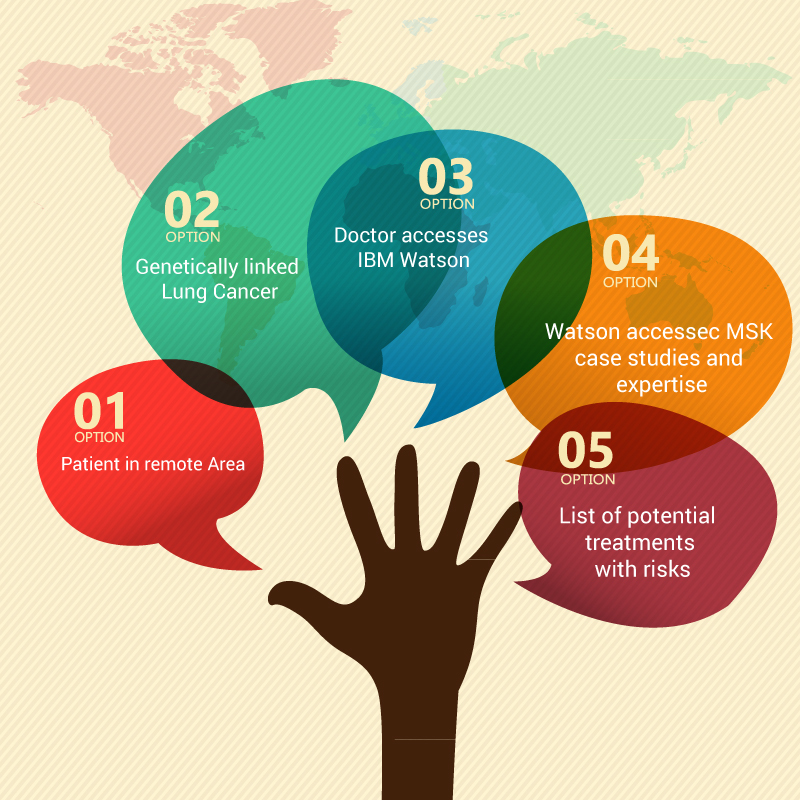 One of the now famous application of IBM Watson has been Watson for Oncology application that IBM had developed in collaboration with New York’s Memorial Sloan Kettering Hospital. The Hypothesis-the fundamental premise on which the is built is rather simple- the doctors of Sloan Kettering Hospital are known experts in certain types of cancer and if IBM Watson could be trained to take on their expertise then the doctor’s knowledge would become easily available as well as accessible to every doctor across the globe. Program- the Watson for Oncology app is one that is a one-stop application for elite cancer care that can be run on the I Pad and other applications as well. Application- a patient suffering from a rare form of genetically linked cancer in one remote corner of Asia might not treated by doctors who possess the expertise to treat the patient in a manner that Watson for Oncology with the aid of the MSK Cancer Center Data does. The implication of this app is way beyond imagination as the doctors from across the world can administer world class treatment to patients anywhere in the world by simply getting a license to the program. Presently more than 80% of all of the healthcare data is rather unstructured which would include most pf the physician’s notes, lab results, Medical reports, MRI and X-ray images, vitals and financial data apart from others. Hadoop helps in providing both the doctors as well as researchers an opportunity to gain insights from the data sets that were not so long ago impossible to handle. The advent of Hadoop has made it rather easier for to manage, handle as well as store huge chunks of data making the candidate so trained incredibly job ready. Hadoop assists researchers in corroborating in data sets with many variables. The video played below only enunciates the application of Big Data Analytics in the realm of Healthcare. These are just but a few examples of how Big Data Analysis has helped resolve major healthcare issues and has also supported in the early detection as well as prevention of diseases. The relevance of Hadoop simply cannot be negated in both the prevention as well as the timely detection of chronic diseases. There still lies a HUGE unexplored opportunity in the application of Data Analytics in the realm of healthcare and there could perhaps not be a more opportune moment for trained and skilled professionals to upskill and accept this daunting but exciting challenge.